Sir Jimmy Lionheart and his sister, Lady Amy, are the finest knights in the realm. They've slain countless foes, laid waste to many invading armies, and are responsible for driving the dragons to extinction. Their prowess has become so legendary, that no opponent is foolish enough to challenge them or oppose the kingdom. After many centuries, peace finally rules in the realm. But the Lionhearts are forged for battle, so after many years peace eventually grew boring. That's when they heard about the Awesomenauts, a band of mercenaries embroiled in perpetual war, and set off to a land far far away to once-again fight side by side. 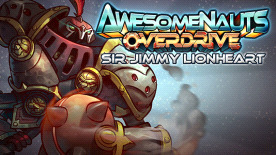 This DLC contains a custom skin for Jimmy and the LUX5000 in Awesomenauts!